This is a pretty quick trip, but it’s beautiful and there are some great historical elements about the drive. Most of the trail is manageable for beginners, it’s only the last stretch of the trail that can be challenging. This trip is a ton of fun, and rolling up on to the remains of a homsteader’s cabin is a very cool site to see. 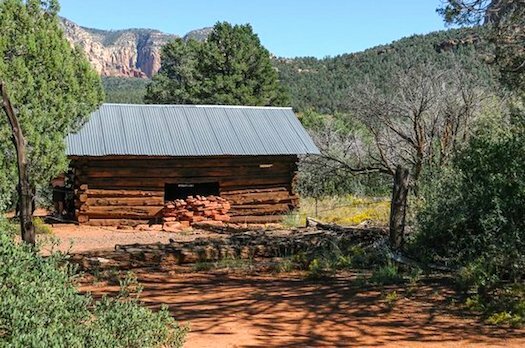 There has been a metal roof added to the historical Van Deren cabin to help conserve it. If you enter the cabin, be sure to watch for rattlesnakes while inside. Set aside some time during your excursion to hike up to Devils Bridge, it’s worth the time while you are there. Should you park, or stop along the road, you're going to want a Red Rocks Pass in the event that a ranger comes by to check on abandoned vehicles. There are several rock ledges that will require careful attention when parking for the day. There is also dense foliage in a few places. Stock SUVs with higher ground clearance can navigate this trail, extreme modifications are not necessary. This trail will certainly amaze you as you navigate your way through the floor of the canyon. If you time the excursion right, you can arrive and hang out in time to admire a gorgeous sunset. Be sure to bring a camera to capture this natural canvas of beauty as it casts it’s light upon the landscape. The trail quality varies throughout the year, depending on rainfall and other natural elements. Even though it is not a requirement, you may feel more comfortable using a high-clearance vehicle, you can take a look at the 4x4 rentals we have available if you're looking to rent a Jeep for your Sedona adventure. Bear in mind that rain or other natural conditions could close the trails. We recommend that you visit www.az511.gov to find out more about road conditions and general info regarding the trail. MYE Jeep is excited to be the only Jeep rental company to offer self-guided Jeep Tours in Sedona. We take pride in our proprietary navigation systems, the quality of Jeeps that we rent, and the relationships we continue to build with those looking to adventure through the great outdoors of Sedona, Arizona. We encourage everyone that has an opportunity to tour Sedona AZ in a MYE Jeep excursion vehicle to take pictures and share your journey with us on social media. We want to thank our Sedona off-road partners and all of you for the adventures, we look forward to providing the rest of you with the most exceptional offloading experience in Arizona. Cheers!